SWIFT: Return of Special Light Aircraft to Coltishall? How a special light aircraft can return to Coltishall – even with its own parachute! Five years after the Wright brothers made the first heavier-than-air powered flight in 1903 in the USA the British Army made its first similar flight in 1908. Arguably, there is no-one better qualified than David to achieve Swift’s ambition; a fully qualified glider pilot before he took his degree in aeronautical engineering, then gaining a powered flight pilot’s licence soon after, David has been involved in all aspects of the manufacturing of light aircraft ever since. In an impressively clean and ordered manufacturing environment where the team are in the final stages of their prototype ‘plane, David clearly demonstrated a passion for excellence and for a determination to succeed. But also with an unforced concern that his company’s efforts will always take the need for being the best of neighbours as their highest priority after that for the safety of their aircraft. So, what will be involved in delivering Swift Aircraft’s ambition and how will they deliver on their ‘best neighbour’ aim? First, they are a SERIOUS company! Serious about their ambition, serious about ensuring that almost everything needed for their ‘plane is sourced from the UK (So, in Swift’s case, their product’s air miles will be very low before their ‘plane takes off! ); only the engine, the only certified aerobatic engine available of the required power, is from the USA while the highly-specialised propeller needed has to come from Germany. They are also serious about their investment. This is no here today, gone tomorrow company! Swift is here for the long haul, investing a total of £5 million in their plans with a Norfolk County Council supporting investment of a further half-million in upgrading the site (which will be recouped in the rents charged to Swift). 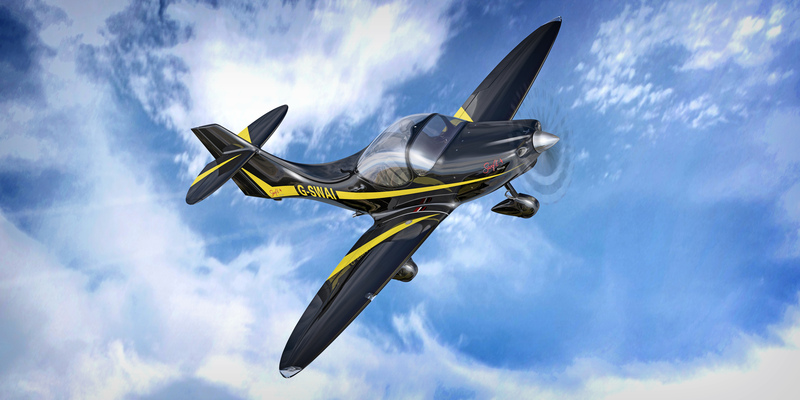 The company has been serious about its market research, in fact, there is no competition anywhere for their fully aerobatic ‘plane; two-seater trainers currently used in flying schools are almost universally from the 1950’s and 60’s. For the private owner there is no other new, two-seat aircraft with its affordability and its flying capability, not to mention the hint of the Spitfire in the Swift’s virtually elliptical wings, while, for ultimate safety, the Swift will also be one of the few ‘planes with its own parachute! But, however serious the company and however excellent the product there may be still some Marlpit readers in the area who are concerned about the effect of the company’s efforts on the local environment. We put these concerns to David. “We have tried to ensure that all our operations are, and will be, respectful of our home environment, from our use of the latest composite technology in the Swift’s airframe to our plans and proposals for flight-testing finished aircraft. In building the Swift we have eliminated the use of ‘wet lay-up’ fibreglass operations, which have a high nuisance value and can lead to allergic reactions in those who handle the compounds used. And our process leads to a mirror finish to the external surfaces which needs no further sanding and filling before painting, in fact we will not be painting at all, each plane will be ‘wrapped’ using the latest vinyl-wrapping technology that we are beginning to see used on cars,” he said. But what about when the plane is finished and needs to be flown, surely that will impact the environment, we asked? But has the company also taken note of concerns of local residents that wildlife will be disturbed as well as themselves with the frequent testing and over-flying, especially once full production of 96 ‘planes a year is reached? It turns out that Swift has had such concerns at the forefront of its planning application explaining that each aircraft will have a single test flight before delivery, there will be no over-flying circuits in flight tests as these will be carried out over the sea to the north and the flight plan will avoid over-flying the solar farm where skylarks and other birds have taken to nesting in the undisturbed spaces under the solar panels. Moreover, purchasers of the craft will have their training flights from Norwich airport, so once the new ‘plane has been tested its next flight will be its delivery flight and it will not return. From what The Marlpit has seen, that hope will delivered, and not just for those of us living around Coltishall but in the wider community as well, with the employment of the hundred or so people who will be involved under full production bringing much-needed quality jobs to our area.